The internet makes me laugh. Especially yesterday afternoon when both @flashboy and @SimonNRicketts tweeted back at me almost exactly the same juxtaposition in their timelines. 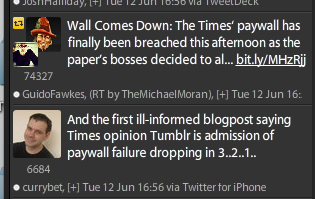 The Times Opinion Tumblr doesn’t, to me, in any way undermine a universal paywall. Look what is on it. Some retweets of staff twitter action. Links to interesting stuff on the interwebs. Some small bits of content that point back into the paywall that remind you who writes for the Times. The new experiment from The Times - a Tumblr for opinion. I’m a Times digital subscriber myself, but it isn’t my #1 destination, and to be honest I only make a couple of visits a month. If the new Tumblr leads to more content being shared and me noticing the Times more, I’ll end up visiting more. It is a win-win. The Times gets a more engaged user, and I get to feel that my subscription is better value for money because I’m using it more. 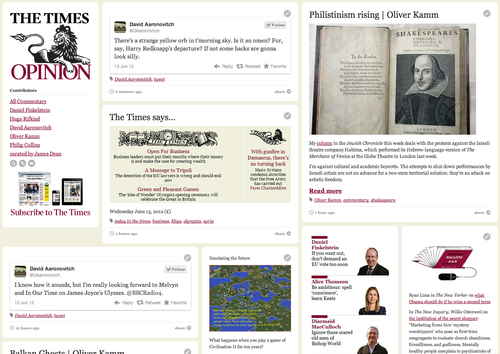 It looks like a promotion and acquisition channel for Times content, not a replacement for the paid model. Here is their own FAQ about the project. I’ve always been quite clear. I don’t see any way that all newspapers can enforce universal paywalls in isolation from everything else on the web. But that doesn’t mean that mixed economic models won’t work, and you can’t charge for some content. I’m a big fan of plural media provision with plural funding models, and I’m glad that The Times took the paywall step because it moved the debate on from the theoretical to the actual. The website might only be one component of the number, but I don’t think many people thought they could build a base of a quarter of a million digital subscribers. I think one of the problems with the endless paywall debate has been that people outside of a universal paywall tend to want to measure it by what they consider success outside of a universal paywall. But the proposition is quite, quite different. Behind a universal paywall you don’t care about huge audience numbers, you care about churn and loyalty and the frequency and depth of visit. You don’t have readers or users anymore, you have customers. And nobody thinks it is odd to tempt paying customers with free teaser content. By Martin Belam on 13 June 2012.